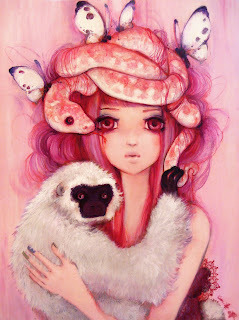 ‘The Garden of Eye Candy’ recently came out and is a must own. While the ads that are running in various magazines don’t do much justice informing one what awaits inside, I just picked up this great collection and it really offers up a great mix of up and coming artists. 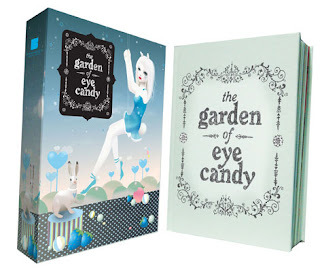 ‘The Garden of Eye Candy’ features an international roster of artists in a luxurious and exquisite box set. 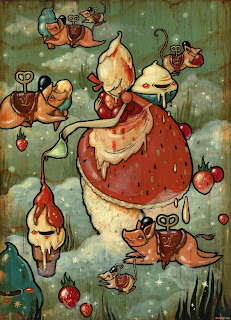 Featuring contributions from several Thinkspace regulars including the likes of Amy Sol, Camilla d’Errico, Lesley Reppeteaux, and KuKula along with Luke Chueh, Nicoletta Ceccoli, Jaime Zollars, Lisa Petrucci, Mijn Schatje, Noferin, Brandt Peter, Koralie, Tim McCormick, Kendra Binney, Danielle Lamberti, Mark Bodnar, Josh Taylor, Danile Lim, Juri Ueda, and many more. Each artist section features a short overview and anywhere from 6 to 8 pages of images. 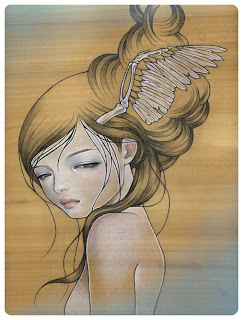 This is the 4th in our ‘sneak peek’ series leading up to our ‘Looking Glass’ exhibit taking place during Art Basel this week, from December 4th – December 7th, in Miami at the Gen Art Vanguard Fair (see previous post for full details) and we thought we’d profile a few names that don’t need much introduction. Watch Arrested Motion for live blogging from Miami during Art Basel / Gen Art Vanguard and we’ll be posting some action too here, so be sure to check back.